We all know very well that when we visit a website, we often find a lot of trackers, or tracking tools, whose main purpose is to follow us wherever we browse, so, that they able to control our tastes and interests, generally for commercial purposes. Now, according to the latest reports, the well-known secure search engine, DuckDuckGo recently said that the well-known ‘Do Not Track’ feature is completely useless, as it is not mandatory for websites to follow it. We all know very well that our data, our tastes and all kinds of personal information is the most valuable or precious thing for most of the large internet companies. As when we visit a website, we often find a lot of trackers, or tracking tools, whose main purpose is to follow us wherever we browse, so, that they able to control our tastes and interests, generally for commercial purposes. 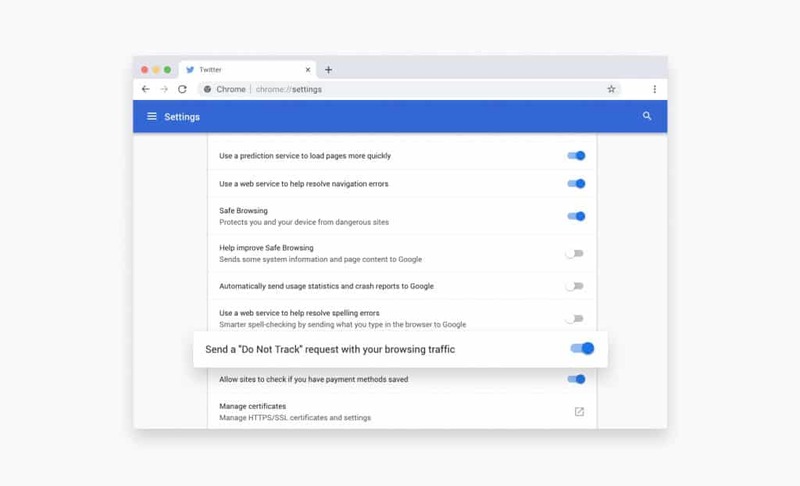 Hence, to get rid of these type tracking tools and methods the tech giant Google recently introduced a new security feature for its most used web browser, of course, Chrome. 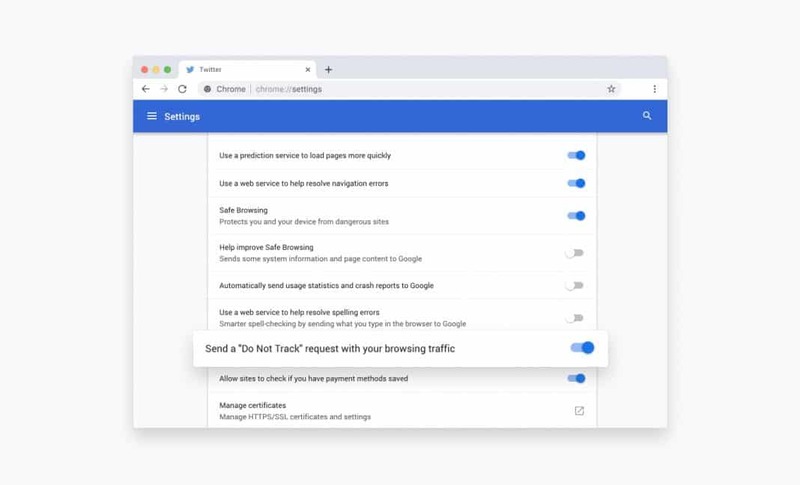 Yes, the tech Google’s most used web browser Chrome has the security feature known as “Do Not Track” which simply allow us to avoid being tracked. But, in reality, this request is totally optional for the websites, as even if we activate this function, still the website remain and work as an administrator, and decides if they want to accept or ignore it, hence, it is not mandatory for websites to follow it. And not only that even the well-known and one of the best secure search engines, of course, DuckDuckGo said that most of the websites simply ignore this request. However, apart from all these things, this security option is usually disabled by default in many browsers. Hence, according to the reports, only 24% of users have this option activated, while 27% it is disabled and the rest of the users do not know if it is activated or deactivated. The DNT requests, Do Not Track, are totally useless, and a sample of it is that some browsers, like Safari, are in the process of eliminating this function, and others, like Firefox, are including new security measures and different privacy for users. Since DNT requests are useless, the well-known secure search engine, of course, DuckDuckGo has always been concerned with preserving user privacy and has an extension called DuckDuckGo Privacy Essentials which is basically designed to allow us to browse the internet much more privately. This extension has been designed to detect the crawlers that appear when we visit a website and automatically block them to prevent them from following us through the websites we visit. Even, it also sends requests to web servers to use encrypted connections, preventing our ISP from tracking our traffic and collecting information about us. Moreover, this extension also allows us to make queries through the search engine of DuckDuckGo and unlike the tech giant Google, it does not save any personal data of users or searches performed through the Internet. Now apart from using the previous extension, the main thing is that we must change the search engine of our browser, especially if we use Google, for another alternative that provides much better privacy to the users. While DuckDuckGo, Search Encrypt, Startpage, Hulbee are some of the best alternatives which really care about our privacy. So, what do you think about this? Simply share all your views and thoughts in the comment section below.